Police chiefs are proposing to mothball Hartlepool Police Station's custody facility. 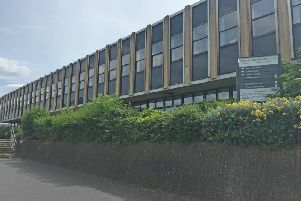 Cleveland Police is set to stop using the office which holds people who have been arrested for questioning in the town. Cleveland Police and Crime Commissioner Barry Coppinger. The force says the suite only sees four people a day. From early next year, people arrested in Hartlepool and held in custody would be dealt with at a purpose-built facility in Middlesbrough. Cleveland Police say the move would make sure people get the best possible support while also saving money in the long term. Significant investment has been put into the Middlesbrough Custody Suite in recent years. It is proposed to mothball the Hartlepool custody suite in early 2019 but could be brought back into use if needed in the future. Assistant Chief Constable Adrian Roberts said: “Regardless of where a person is arrested their welfare is a key concern. "It’s often not until they are in the cell that their needs are identified, and by taking them to the purpose built facility in Middlesbrough we can ensure that they are able to access any necessary support services at the earliest opportunity. Barry Coppinger, Cleveland Police and Crime Commissioner, has agreed in principle to the changes. Staff consultation is underway and police say further details will be published in due course. Investment at Middlesbrough Custody Suite has recently included having senior healthcare practitioners on site 24/7 and direct referrals to a range of support services to ensure safety and divert people from offending. As a result, people who are vulnerable or need medical attention when arrested from across Cleveland are currently taken to Middlesbrough.